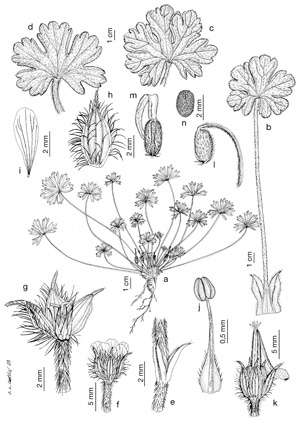 Abstract: A taxonomic revision of the genus Geranium (Geraniaceae) in the western and central Pacific area is presented. The area studied includes Japan, Taiwan, Indonesia, East Timor, Papua New Guinea, Australia, New Zealand, and the Hawaiian Islands; the genus is not known to be present on other islands in the Pacific Ocean. Geranium is represented in this area by 53 species assigned to two subgenera: subg. Geranium with 46 species (four introduced) and subg. Robertium with seven introduced species. The greatest diversity is in New Guinea and Japan, both with 11 species; the species of New Guinea are all endemic, while the diversity of Geranium in Japan includes three endemic species and eight species shared with mainland Asia, one of the latter extending to North America. Other areas of high diversity of Geranium in the Pacific area are Australia and New Zealand (nine species, all endemic), and the Hawaiian Islands (six species, all endemic). Geranium comprises mostly herbaceous perennials with aerial stems. The leaves are usually palmatifid or palmatisect, and the flowers are actinomorphic and pentamerous with ten stamens. The distinctive beaked fruit typical for the Geraniaceae is shared by all species. The endemic species from Hawaii differ because of their shrubby habit and obtriangular-cuneiform to ovate leaves, usually serrate at the apex. One of these species, G. arboreum, also has zygomorphic flowers. The nomenclature was reviewed for each taxon. Full synonymies, descriptions, and a key are provided. Each species is illustrated and mapped. Two neotypes and 39 lectotypes are designated. One new species, G. castroviejoi, and one new combination, G. grande, are proposed.